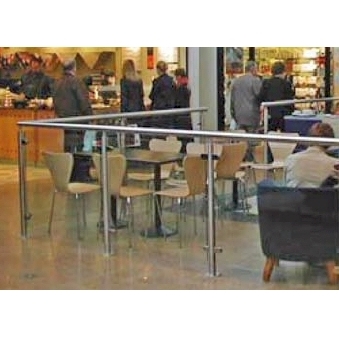 Tripwire can provide you with handrail and balustrade solutions that comply with all necessary Building Regulation requirements and British and Irish Standard recommendations for structural stability, safety and accessibility. We work as a complete supply and fit service from producing quotations from architects’ drawings or bills of quantities to on-site measurements, production drawings for customer approval, manufacture and then install on site. So whatever the project, whether a hospital, school or bank, offices, etc. we can ensure a quick delivery, and a speedy installation once on site. In particular, our systems conform to BS 6180 and BS 6399 and, where glass infill panels are used, to the safety recommendations of BS 6206, Class A. They will, therefore, be acceptable for both new construction and for the refurbishment of buildings used by organisations whose activities are subject to the Disability Discrimination Act. The exceptional finish to our products and our attention to detail ensures a high quality installation. Our Modular Balustrade is aesthetically superior as there are no unsightly welds, no sharp edges or angles. Our balustrades consist of the following components: top rails, uprights (painted if desired), infill, infill panel holders. All top rails have an outside diameter of 50mm. The top rail and infill panels are demountable, making it easy to repair the balustrade without damaging the surroundings. Our balustrade infill is available in as 10mm toughened safety glass with other options available on request.